Lotus stem are very healthy with high nutritional content. These are good source of calcium and even help to control blood pressure, thus should be included in routine intake. Fritters are very interesting way to incorporate it in our diet. We have chosen the healthy way to use them. 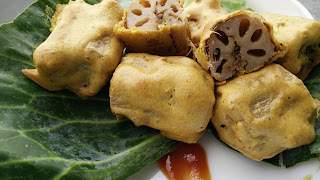 Deep fried pakoras are quite common but the air fryed lotus stems taste even more delicious. 1. Slit all the boiled lotus stem pcs and add a mixture of all spices. 2. Prepare a batter of gram flour and water, add salt, red chili powder and oil and mix well. Coat all the pcs with this batter. Keep the coated pcs on greased foil paper. Put these foil papers in preheated Airfryer at 180 degrees for 15 min. Once cooked, remove from the paper. Serve hot with chutney or sauce.